And finally, this classic film. So much reputation that it would make no sense for delaying also the great Pacino. The plot is not hard to explicate, easy to divided into few parts. Could we take the middle part as the body through which show the psychic development of our two characters, the rather offensive performance movingly catches the sensitivities of this veteran who are quite like the stranger of society or outcast, the reason behind his blinding was told by his relatives, and yes, this move hurts him and we could find the subtle facial movement by our mr.pacino, the culminating scene is the speech delivered by him in an almost mad way, the content is so romantic and touching, we could fathom the tortured soul behind his icy face. The intact soul or say the integrity of young boy truly sentimental. Yes, knowing the right way might not the hard part than to really commit it. Didactic? At least in a artful way. 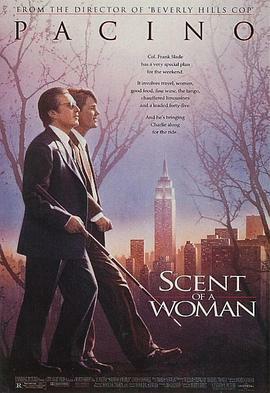 And about the title, the scent of woman, well, it could say a lot about this film, scent not sight, it moves in a invisible way which needs your eyes of heart.